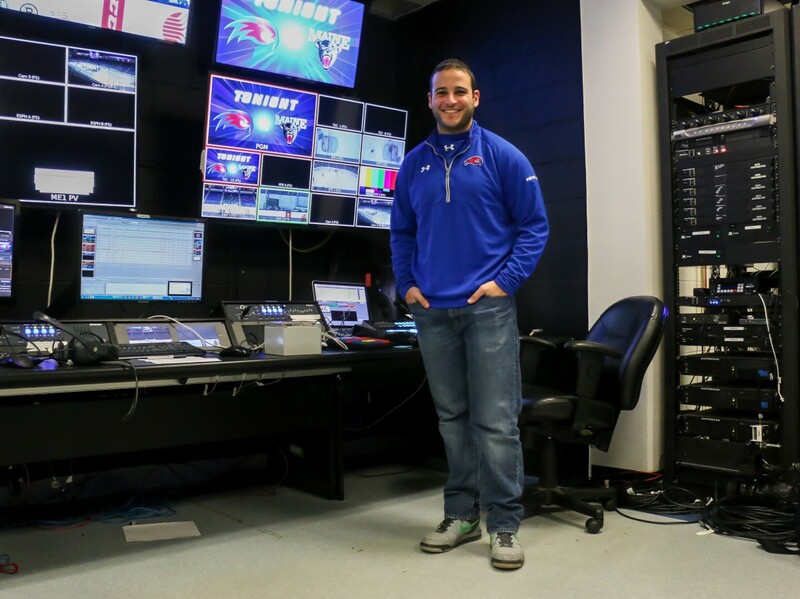 Sebouh Majarian, the assistant director of New Media for the UMass Lowell athletic department, had his first welcome to college sports moment on Dec. 8, 2013 when he walked into an office in chaos. He remembers being warned as he walked in that it would be a tough day at work, and it was quite an understatement. It was the last day at the office for the assistant director of communications at the time, and another integral employee had been let go that same day. As Majarian walked in after working a shift at his other job, he saw a whopping two people: Bob Ellis and another part-time worker. So, Majarian saw, it was going to be one of those days. Majarian has been touting that same philosophy for his entire time at UMass Lowell, which began in October 2013. For those at home doing the math, Majarian had his trial by fire a mere two months after being hired. And for what it is worth, Majarian did not even intend to end up where he was today. At the beginning of his professional career, Majarian relied on the help of Ben Jewart, the director of audio visual services at the Tsongas Center, to help bring him up to speed. “If I’m an unsung hero, he’s the unsung hero to the unsung hero. I didn’t know what an SDI cable was, I didn’t know anything,” he said. To be fair, he was a bit more accustomed to working on the other side of a camera. During his time at West Virginia University, Majarian served as the sports anchor for WVU News and wrote for the school newspaper. Ending up as the multimedia go-to of UMass Lowell Athletics was not a path that Majarian expected to go down, but life has a funny way of doing what it wants. The transition from his work as a writer to the man behind the camera began as he was assigned a role as a sports information director (SID) for men’s basketball, baseball, softball and women’s basketball. “I had never done anything like that before. I had no idea what I was getting myself into. But I was just like, ‘Oh, travelling with men’s basketball. Sounds like fun. Let’s do it.’ It was right up my alley,” said Majarian. In addition to serving as those sports’ primary contact, Majarian also did video highlights for the department and found himself becoming overwhelmed at the different directions he was being pulled in. So, he was given a choice: SID or video. “It was just kind of a perfect storm. The chips fell, it was like right place right time. I kind of stumbled into it and tried to make the most of it as I went,” said Majarian. It is all fine for him; Majarian says that all he wanted was to work in sports. West Virginia’s electric atmosphere and love for their teams drew him in to pursue a degree. Sports made him tick. He loves basketball and has several bits and pieces of Celtics memorabilia scattered around his office/studio complex in the Tsongas Center. Much of his motivation in working for the university is to get students excited about their sports teams. “UMass Lowell wasn’t really on the map [in 2013], besides like hockey or whatever… that’s something I want to establish here, making people like the students here as crazy about the sports as I was,” said Majarian. Going from the frenzy of Dec. 8 to putting basketball and hockey games on ESPN3 is stupefying for Majarian to consider. His first highlights pale in comparison to the ones that he and the department put out now, and the Rise Up campaign has been exemplary of the progress that the university has made in such a short time. UMass Lowell has gone from using flip cameras to interview coaches to equipment that is on par with the rest of its peers in Division I. And while the stress of putting games on television and compiling highlights has made him lose some hair, as Majarian jokes, the work is rewarding in the product he turns out. “How often can you make a game yours?” Majarian said.